Using title effects allows you to add text to your video – as a title at the beginning, an element during the main story, or as credits at the very end. Besides changing the look of the text itself, you can also send the text running on a path across the screen. Title effects only affect the clips in the Master Video Track that appear within the title’s duration. Title effects contain character presets, animation and background options, which you can modify to best suit your video. All of these options are found in the Title Designer. select a title effect in the Title Track and then click Modify. within the Title room, click on to create a new title template from scratch. within the Title room, select an existing title effect and then click on to edit the existing template. click on to add additional text to a title effect. click on to add images that accompany the text. You can change the position and orientation of the titles in a title effect quickly and easily. Note: click on to use the TV safe zone and grid lines to help with the precise movement of the title effect on the master video. 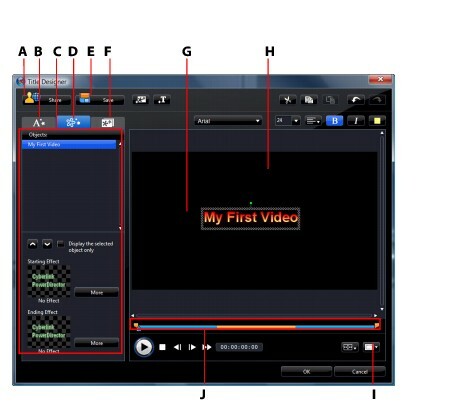 Select Snap to Reference to have the title effect snap to the grid lines, TV safe zone and boundary of the video area. click on the title and drag it to a new position. click on above the title to change its orientation. Within the text properties tab, you can modify everything from the text size, style, color, as well as adding shadows and borders. To modify the text font style, size, weight or alignment, simply use the available options above the preview window. You can apply a defined character preset to a title effect. After you have applied the defined character preset you can go to font face, shadow or border settings to make changes to the title effect if required. To apply a character preset to a title effect, click the text properties tab and then click . Click on the text in the preview screen that you would like to change and then click on a character preset from the available list. You can customize the font face settings of the title text, including the color, and adding blur and transparency effects. To customize a title effect’s font face, click on the text properties tab and then on . You can add a shadow around the text in a title effect. Available options allow you to change the shadow’s color and size, distance from the text, and add a transparency or blur effect. To add a shadow to a title effect, click the text properties tab and then click . You can add a border around the text in a title effect. Available options allow you to change the border’s color, size, and add a transparency or blur effect. When adding a border to a title effect, click the text properties tab and then click . n the animation properties tab. click Starting Effect and select a starting animation effect from the available list. click Ending Effect and select an ending animation effect from the available list. To edit an imported image, select the image object in the list or click on the object in the preview window. You can then add a chroma key effect on the image, or flip the image upside down or left to right. You can modify the speed of a title effect’s animation. The following two factors determine the speed for the animation to complete. The longer the duration of the title effect clip in your project’s timeline, the longer it will take for the title effect animation to complete. For example, if the title effect clip is 20 seconds, it will take the title effect 20 seconds to complete the beginning and ending animation. The keyframe timeline is located below the preview window. The title effect animation has four keyframes. The first two keyframes indicate the start and end points for the beginning effect, while the last two indicate the start and end points for the ending effect. If you would like to change the start or end time of the effect or how long it takes for the beginning or ending effect to complete, just drag a keyframe to the desired position in the timeline. Note: the orange line indicates how long the title effect displays on screen once the beginning effect animation is complete. You can add your own background images to a title effect. The background image is added to the entire title effect and will overlay the content from the Master Video Track. To apply a background image to a title effect, click the background properties tab and select the background you wish to use from the list. Note: if you don’t see a background image you like you can import your own image. Click to import a custom image. Once you finish modifying your title template you can save it to your Title Effects Library for future use or upload it to DirectorZone to share it with others. click on Share to upload your custom title template to DirectorZone. click on Save to save the modified template as a new template in your Title Room. click on to save a customization you made to title text as a new character preset.